It will be a time of mixed emotions for 2005 Mid-Pacific graduate Kip Masuda when the Long Beach State junior catcher returns to Hawaii next weekend for a series against the Rainbows. 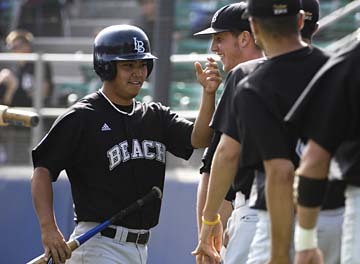 Next weekend expects to be a homecoming of mixed emotions for Long Beach State junior Kip Masuda (Mid-Pacific '05). The Dirtbags catcher returns home for the first time since high school to play Hawaii in a three-game series March 7-9 at Les Murakami Stadium. It won't be his first experience playing on Hawaii's biggest baseball stage, but Masuda hopes these memories turn out much better than the ones he currently has. As a junior at Mid-Pacific, Masuda was part of the team that advanced to the state championship game against Punahou. Current Rainbows Harrison Kuroda, Ryan Asato and Jayson Kramer were all a part of that Owls squad that was shut out by Punahou, which has won every state title since. The funny thing is it's not the loss that Masuda remembers the most about the game. It's the surface that they played on. "I didn't care for that turf at all," Masuda said. "(The ball) just bounces and rolls and rolls. Now that they got that new (DOMO) turf, I'm pretty excited. It should be a lot better." » Notables: 2005 Star-Bulletin position player of the year; drafted out of high school by the Kansas City Royals in the 47th round of the MLB Draft. » Greatest baseball moment: The first multi-homer game of his career with the Brazos Valley Bombers last summer in the Texas Collegiate League. Like his Owls teammates, Masuda wanted to continue his playing days for the hometown school. After not getting much interest early in the recruiting process, Masuda visited a camp in Long Beach, Calif. It led to a couple of doors being opened and on the first day kids could sign letters of intent for baseball, Masuda committed to Long Beach State. He had his mind made up and everything seemed fine until a surprise phone call made him think twice about his immediate future. "I was at the baseball field working out when I got a call from Eric (Tokunaga, Kansas City Royals scout), who told me I had been drafted by the Royals. It kind of was (a surprise). I wasn't even watching it on TV." Suddenly, Masuda was faced with the possibility of making the jump into professional baseball from high school. As tempting as it sounded, he knew the jump to college was already going to be a tough one. He also talked it over with his parents, who stressed to get an education first. The offer was tempting, but Masuda honored his commitment to play at Long Beach State. "(Tokunaga) made me a believer I was pretty good," Masuda said. "I really didn't think I was ready for pro ball." Masuda had three hits in his first start at catcher for the Dirtbags and finished his freshman season hitting .314 with a home run in 17 starts. It was a solid opening campaign and with the regular starting catcher graduating, Masuda saw an opportunity to take over the starting spot by the time he was a sophomore. Before he got that chance, his world was turned upside down. His father, Brian, who Kip was very close with, died a month before the season was scheduled to begin. Masuda immediately flew home to be with his mom, and thought about taking the year off. But after thinking about what his dad would have wanted, Masuda decided to make the difficult journey back to Long Beach to continue playing ball. "I asked my mom if she wanted me to stay home and she told me that I should keep going on with it," Masuda said. "It crossed my mind, but I think I wanted to keep playing." He took with him a gold chain that his father always wore. Masuda plays every game with it strapped tightly around his neck. "My mom kind of was afraid of me wearing it," Masuda said. "I lose a lot of things and break a lot of things, but I'm pretty sure I won't be breaking this." It'll be a weekend of mixed emotions when the Dirtbags face the Rainbows. Masuda doesn't know what to expect, but plans to have plenty of support in the stands. "From what I hear, a bunch of people are going to show up," he said. "Hopefully, I can get some playing time and give my family something to cheer about." Masuda has started in two of the Dirtbags' first four games. No. 10 Long Beach State opens a three-game series with No. 20 Wichita State today. Masuda tripled and scored a run in his last game and is showing signs of regaining the stroke that made him a .300 hitter as a freshman. "I'm just trying not to really think about it much this year and just play more, be with my teammates more and enjoy it more," Masuda said. "I'm having a little more fun instead of being so serious on the field."